It’s the season of all things PUMPKIN!!! My absolute favorite time of year. Crisp air, leaves changing, apples galore and cozy sweaters. And BAKING! After a few months of very limited oven use, we make the switch to roasted veggies, potatoes and LOTS of baked goods…such as cookies. I had this vision in my head of a pumpkin molasses cookie and as soon as the weather cooled down, I started running trials. I cooked up some dried garbanzo beans and saved some brine for an “egg” – used applesauce, did an oil-free batch, played with flours and sweeteners. The first batch turned out way too cake-y for my liking, but got the thumbs up from our toughest critic…Willow. Second batch was still too cake-y and a bit too much molasses – yes, I said too much molasses. Third and fourth trials got closer, but just didn’t grab me. Let me share that through all of the mess up trials, Willow gave each one a thumbs up…clearly in it for the chocolate chips. Fifth batch was a giant win. A slightly crisp initial bite with a soft, chewy center. Exactly what I was looking for! I knew it was the best batch yet when Willow’s eyes lit up with the first bite and asked for a second one when the first cookie wasn’t even half eaten. Before I dive into the recipe, I have to share one of my favorite kitchen gadgets. 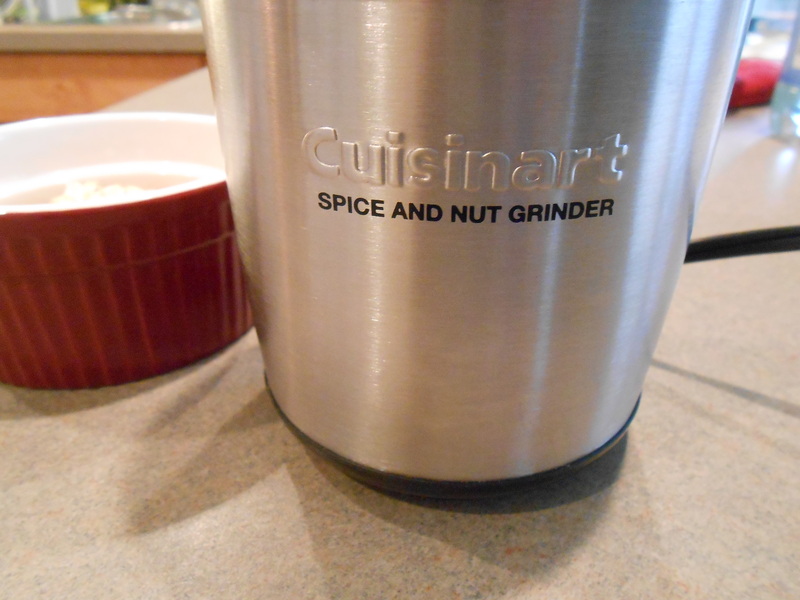 A couple of years ago, my parents bought us this amazing little Cuisinart Spice and Nut Grinder. Since this came into our lives, we buy whole spices and grind the seeds ourselves, along with making a lot of our own flours. 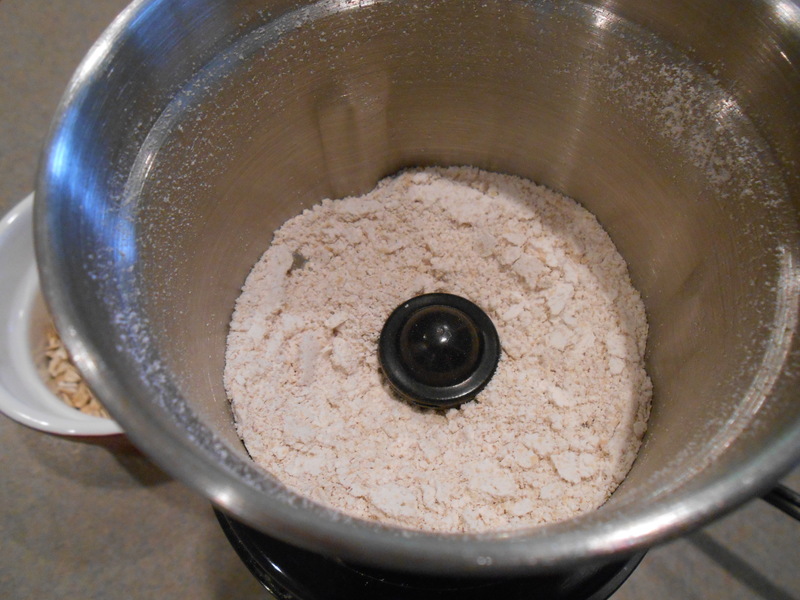 Literally within seconds you can turn rolled oats into oat flour. Yes, a Vitamix can do the same thing, but this is easier clean up and faster. 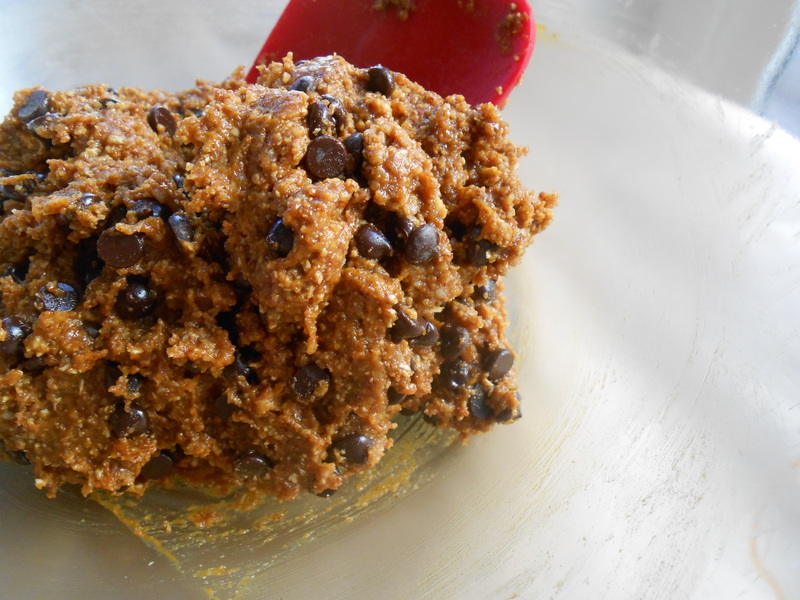 In a large bowl, combine all the dry ingredients (except chocolate chips). Whisk until incorporated and if you need to, use your fingers or the back of a spatula to break up the pecan clumps. In a small-med bowl, combine the wet ingredients until smooth. Using your hands or a small cookie scoop, form small balls. My cookie scoop was a bit smaller than a tablespoon measure. 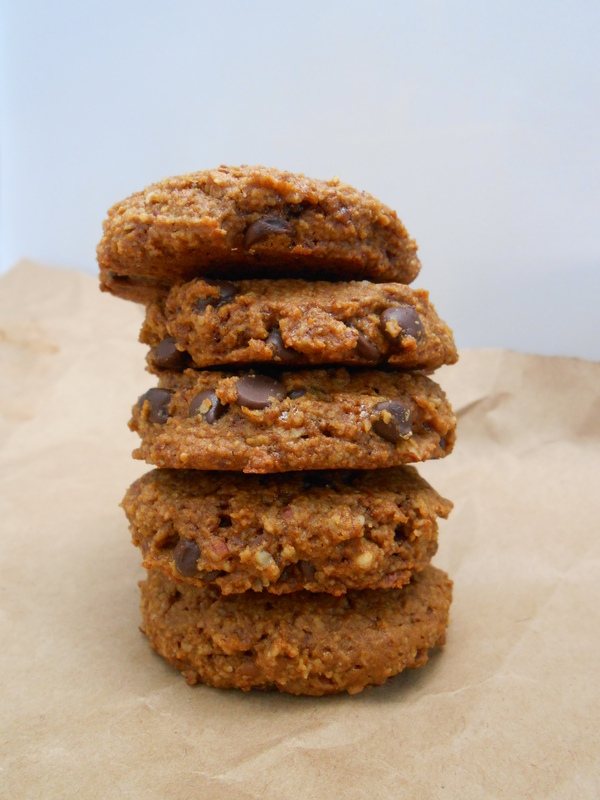 Place them on the baking sheet and flatten with the back of a spatula or wooden spoon. You can press in extra chocolate chips to each cookie at this time, if you’d like. Bake for 12-16 minutes or until the cookies no longer look sticky/wet and can easily be removed from the baking sheet without sticking.They’ll be slightly golden brown. If you’re looking for a super crispy cookie, bake them for a few minutes longer, but keep a close eye on them so as not to burn them. Our oven is awful and we have to always cook/bake things far longer than called for. I baked a trial for 22 minutes and they turned out crispy inside and out. 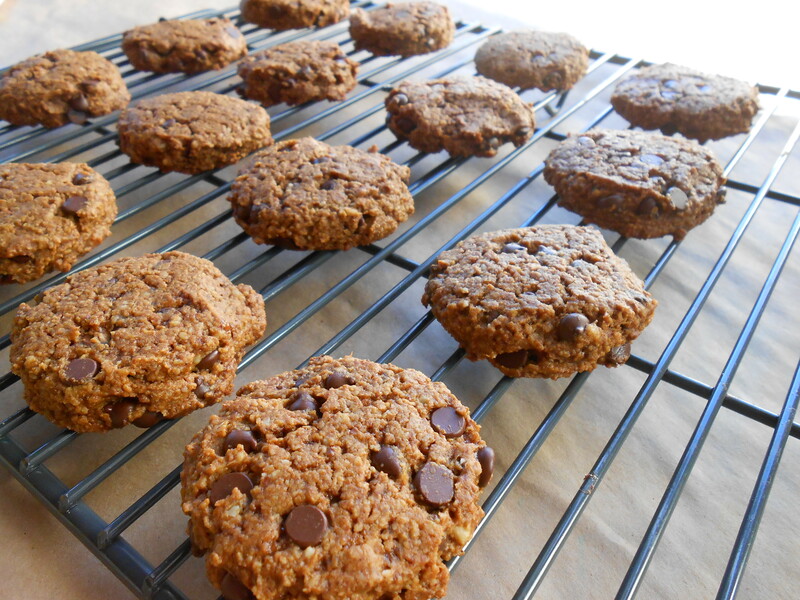 For a softer/chewier center, stick to the initial baking time. Remove from oven and allow the cookies to cool on the baking sheet for five minutes. Transfer to a cooling rack and ENJOY! I had to distract Willow with some bad dancing and singing to allow the cookies to cool a bit. 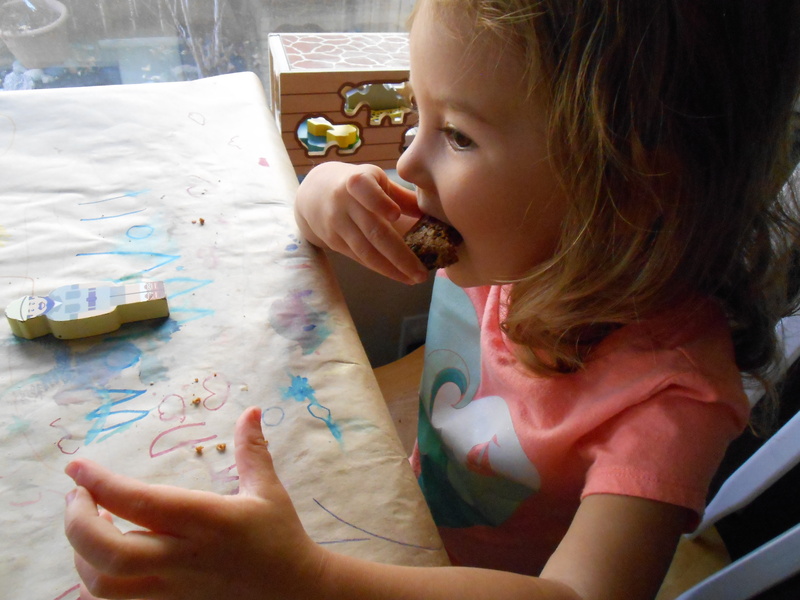 This kid is a chocoholic, so patience doesn’t come easy. Be glad that there weren’t any photos to document that portion of our baking session. These are best eaten the first day or two, which is pretty easy to do! If you do have leftovers, store them in an airtight container (preferably a cookie tin). 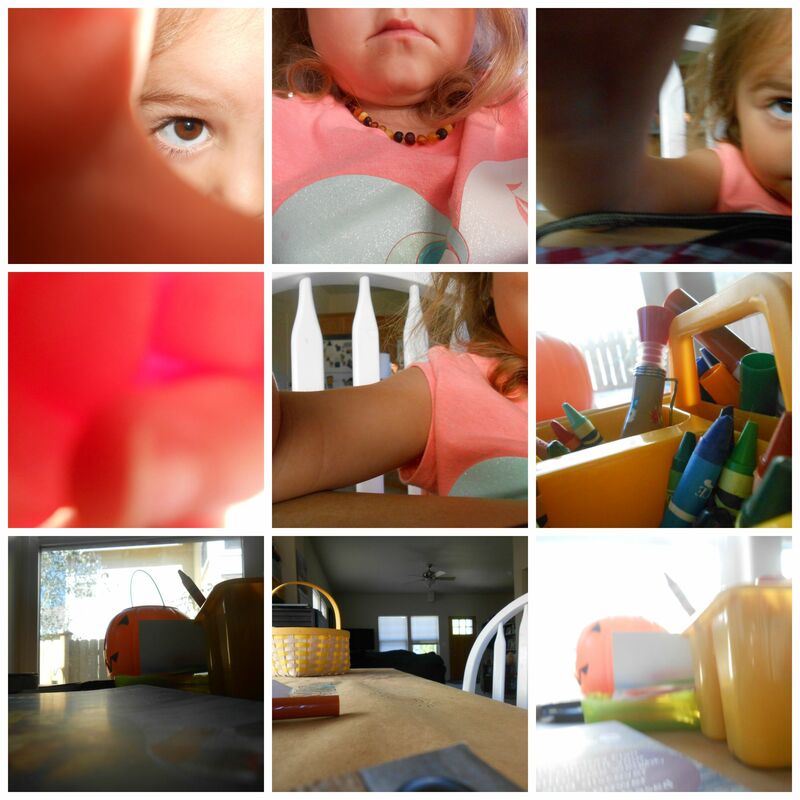 While we were waiting for the cookies to bake, Willow asked to play around with the camera…here’s a small collage – I picked my favorites from the 50 that she took! I’m rather impressed that she managed to get some selfies in there. What’s your favorite pumpkin recipe?! I am definitely making those cookies! They look so good! I finally got some agar agar powder that I hope to use in making pumpkin pie. Omg Willow is getting so big and she is just so beautiful! Love that picture of her eating the cookie. These cookies look out of this world delicious and I think you know pecans are my favorite nuts, so I’m in LOVE with the fact you put them in there! They make things so moist. 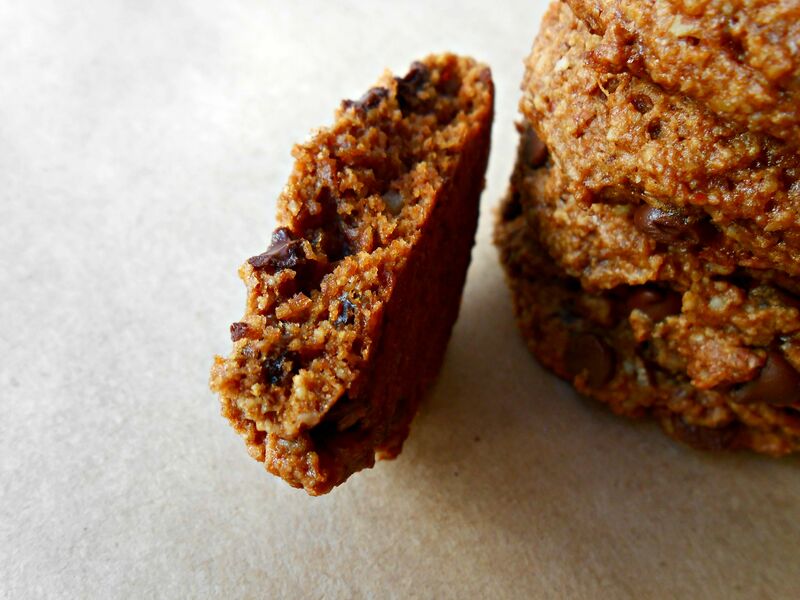 I used pecan flour in cornbread and pecan butter in my chocolate chip cookies because they make things so buttery! I want a whole stack of these now! I hear you on the trialing too….sometimes I feel like I’ll never get it right, but perseverance pays off, haha! I need to try these so bad! I love that you didn’t use too much pumpkin either. I don’t like a strong pumpkin taste, so these are perfect! Isn’t she?!?! SO bittersweet! She was a little helper throughout the trials (measuring, mixing, but mainly eating chocolate chips). Pecans are my favorite, too!!! They’re so buttery…roasted pecans are my weakness – I literally have zero self control if we make them. I tried three trials without pecans and they weren’t nearly as good – pecans are rather magical. Oh, I’m pretty sure I ate a nice stack’s worth…one of the downfalls of all the trials! Please let me know if you ever try these. I’m right there with you on the too pumpkin-y flavor. My first batch I used just under a half cup and it was too strong…luckily, that was also the trial where I added too many chocolate chips! Ha! I NEED to make those cookies. Oh how I love real tasting pumpkin… Not all the artificially flavoured crap sold in stores! I had only bought one can of organic pumpkin at Trader Joes last time and used it up already! Now I’m forced to wait to make these until I can buy more pumpkin! These sound amazing! I can’t really say no to cookies, it’s a huge issue. And I LOVE pumpkin chocolate chip. 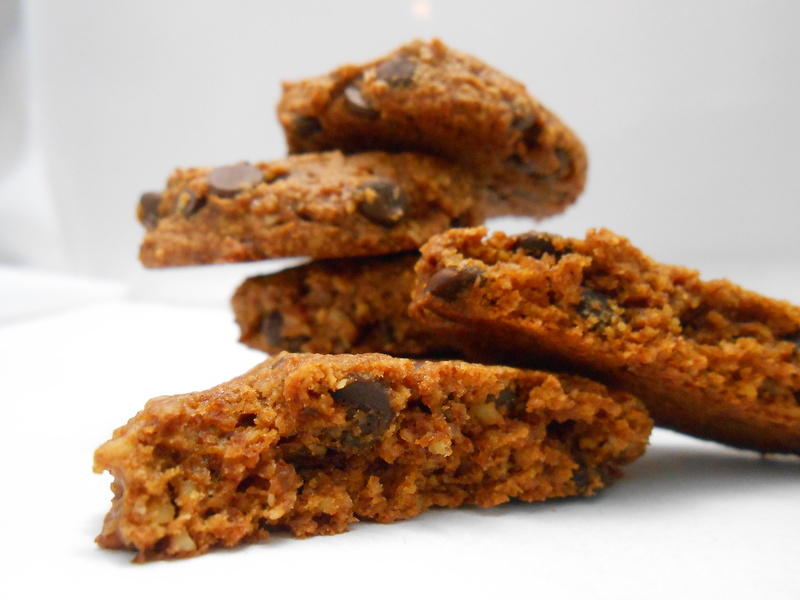 Baking with pumpkin gives such a great pillowy texture which goes so well with slightly melted chocolate chips. i think I’d eat these all straight from the oven! I love your posts so much, the photos and your writing just pull me right into your kitchen! 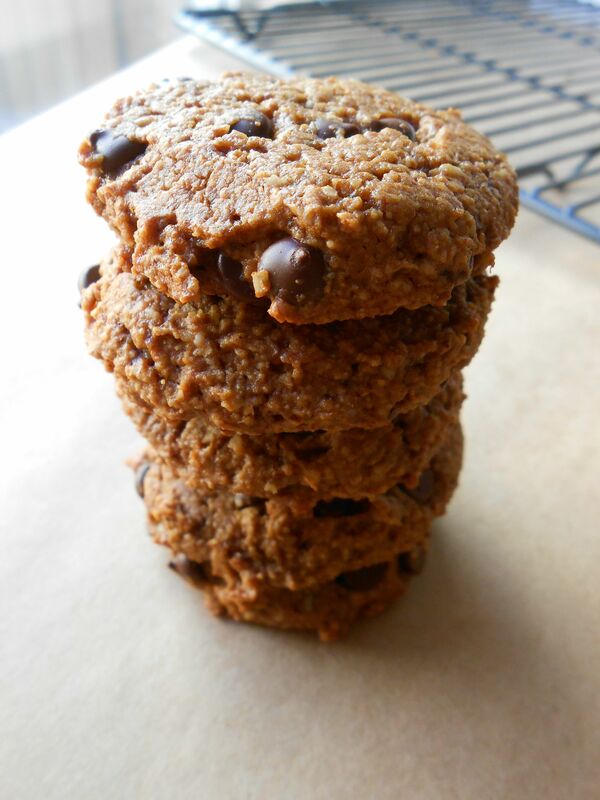 And I think you would have to distract me with some singing on dancing too if there were warm pumpkin chocolate chip cookies around 🙂 Texture looks perfect, and you know I love the flavors! Natalie! That is so sweet! I ramble a lot, but I’m working on not doing it so much. The kitchen is like my sanctuary and there’s nothing better than a little baking therapy to ease the stress or anxiety.